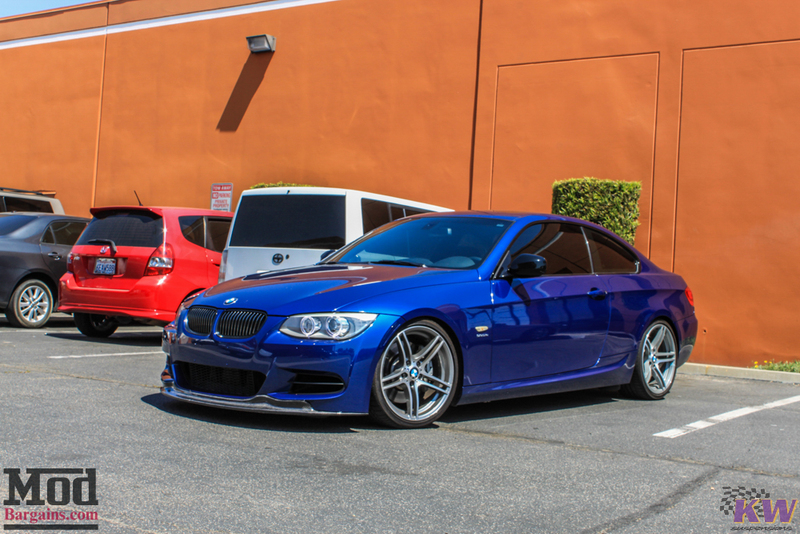 A while back we had this gorgeous Deep Sea Blue E92 BMW 335is come into the shop for some upgrades from Evolution Racewerks, VRSF and Mishimoto. 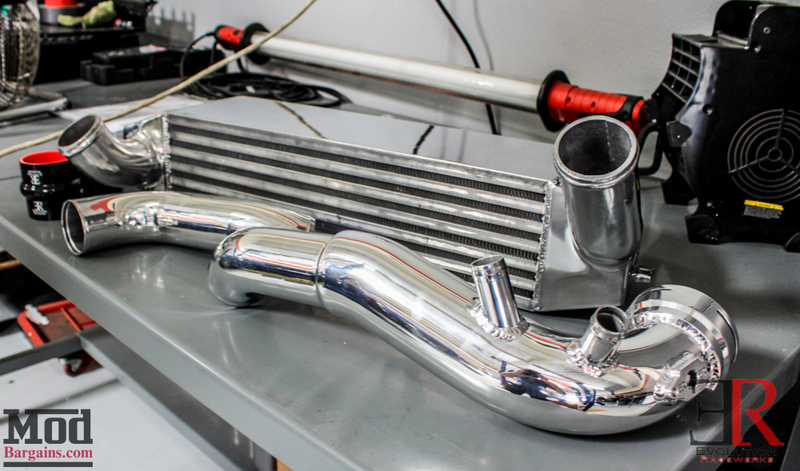 These three mods alone will help make the most of the BMW N54 engine under the hood and keep the car running happily for many miles to come. The Evolution Racewerks Intercooler for E9X BMW 335i and Evolution Racewerks N54 Chargepipe (set up for uprated diverter Valves) will significantly improve performance, the chargepipe improves flow and eliminates the possibility of failure (the OEM plastic chargepipes are popping left and right these days), and a set of uprated Diverter Valves from Forge Motorsport ensures that the car holds the boost it makes, recouping 26lb/ft of torque that’s otherwise lost. Here’s the Evolution Racewerks Intercooler mounted into place. 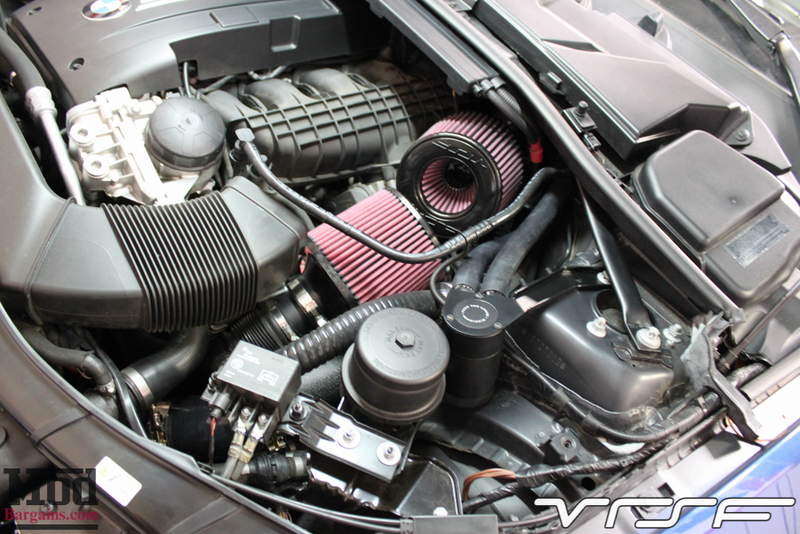 As we’ve mentioned before, the N54 is Direct Injected and Turbocharged, meaning that these engines suffer from some pretty ridiculous carbon buildup – ridiculous in the sense that it accumulates as quickly as 20,000 miles and how dirty the motor can get in that short of time. Direct Injected Turbo Cars will ALWAYS have SOME oil blow by (even new, there is NOTHING wrong with your engine, it’s a FACT OF LIFE. IT’S GONNA HAPPEN.) 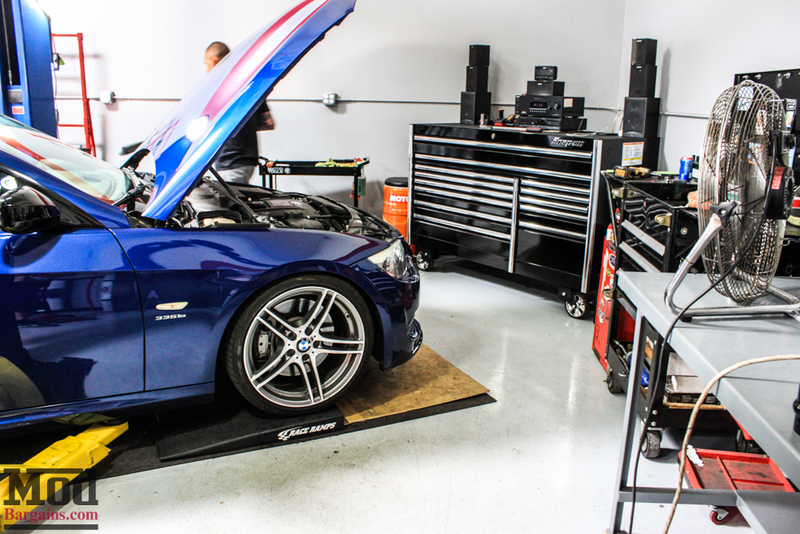 – so to keep the motor running its best, you have to have it cleaned – via Walnut Blasting Service (available at ModAuto from $495, dealers/other shops can charge $1200+) that BMW recommends be done every 30k, and Cobb Tuning and Burger Tuning won’t touch your car until you have the cleaning done. 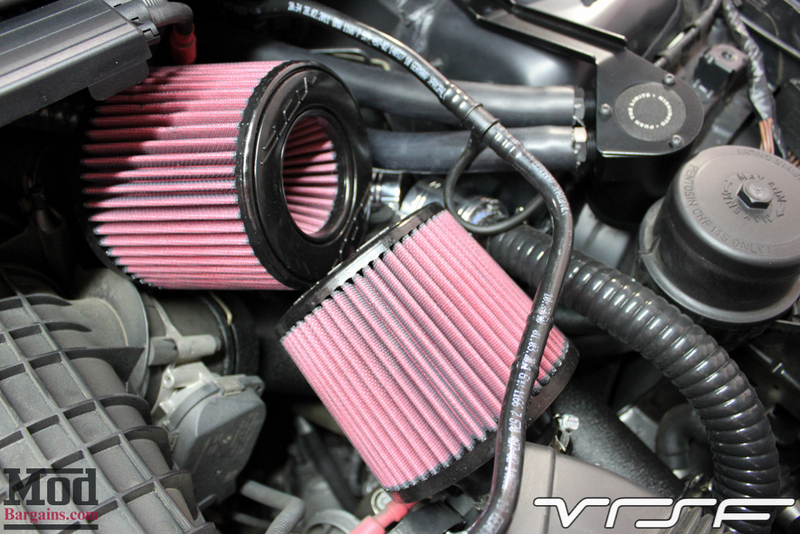 It has a HUGE impact on your engine’s performance. To help mitigate the excessive carbon build up and keep your walnut blasting services spaced much farther out – and keep your engine running happy for longer- check out Mishimoto’s new Direct Fit Oil Catch Can for BMW N54 engines – these baffled catch cans trap the oil vapor that normally would reenter your intake tract, coating your intake valves, intercooler etc with a sheen of oil. By preventing that oil from entering the intake at all, the Mishimoto Catch Cans prevent the carbon buildup from occurring. While it doesn’t stop ALL carbon build up (it’d still be a good idea after 70-100k, even with an oil catch can installed for 70k), it does a LOT to keep the cleaning services spaced MUCH, MUCH farther apart. 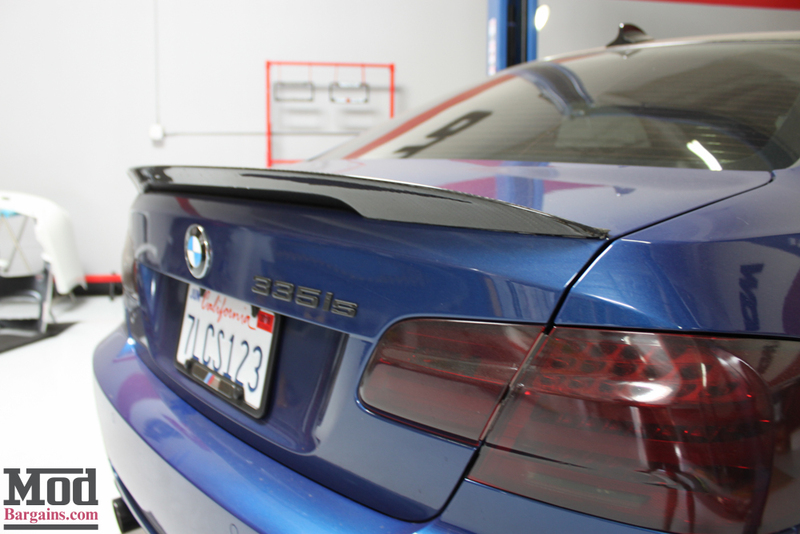 With the N54 BMW 335is, a few components are in the way that prevent the catch can from mounting in its normal position. That’s why Mishimoto developed this unique bracket to put the catch can off to the side and out of the way. 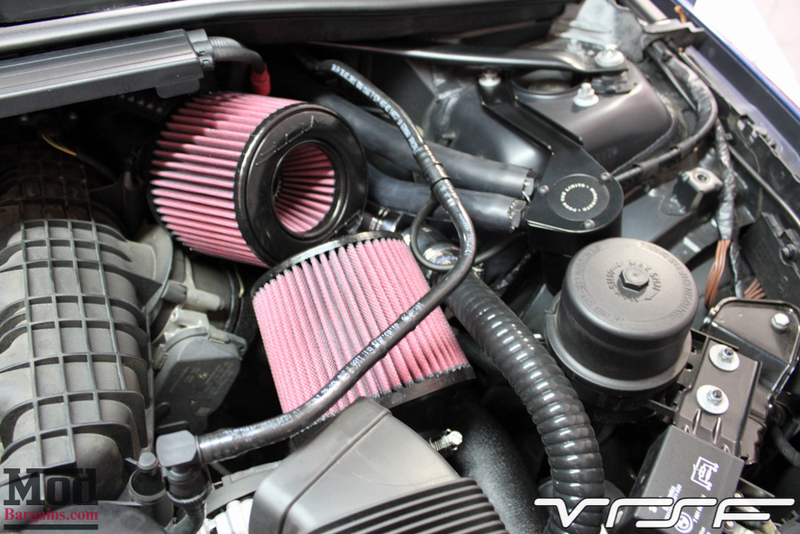 Here’s the Mishimoto Oil Catch Can next to a VRSF Dual Cone Intake. 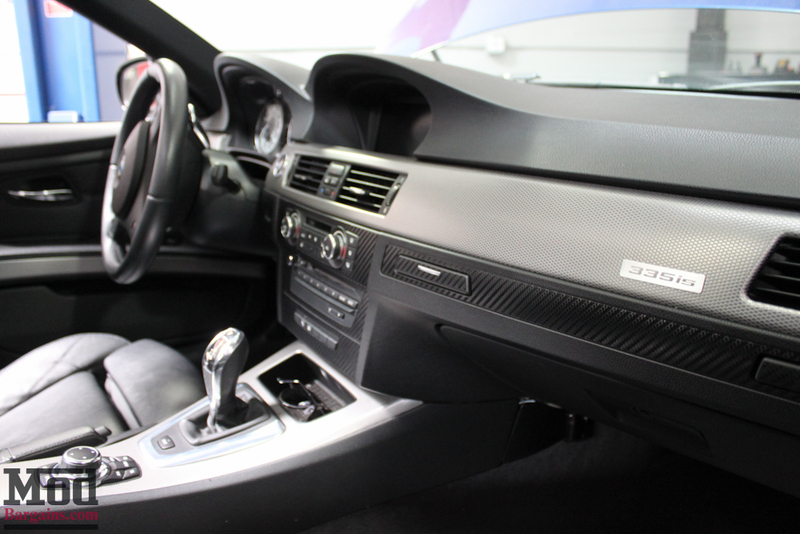 The 335is also gets a few unique touches on the interior, we really like the dash plaque and so we snapped this pic. With the Mishimoto Oil Catch Can, Evolution Racewerks FMIC, ER Chargepipe and VRSF Intake installed, this 335is is purring like a kitten but packs the authority of a Lion under the hood. Whether you want to just get another 20hp out of your 335is or you want to turn it into a fire-breathing beast, you can count on expert advice from the Mod Experts at ModBargains. Call 714-582-3330 today to speak to one of our enthusiastic experts today.